Joanie Leeds is back and better than ever with her eighth (8th!!) children’s/family album. 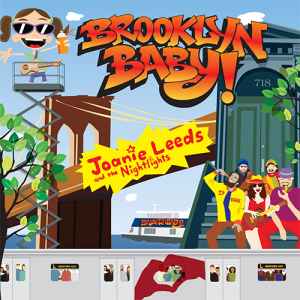 While the album as a whole is an ode to Joanie’s beloved Brooklyn, the majority of songs can be enjoyed by listeners, no matter where you live. From the opening line of “Ferry Nice,” /It’s ferry nice, It’s ferry good/, the lyrics will get in your head and have you singing along (I woke up with the song “Subway” rattling around in my head just this morning). Her softer side comes out on the beautiful song of acceptance, “Love is Love” as well as her cover of Lou Reed’s “Sunday Morning.” Backed by the Nightlights, Joanie creates a delightful album about a place that she loves that families wherever they may be will want to listen to again and again. Check out the video for “Ferry Nice” below.